Hello! This is Terry Craig. 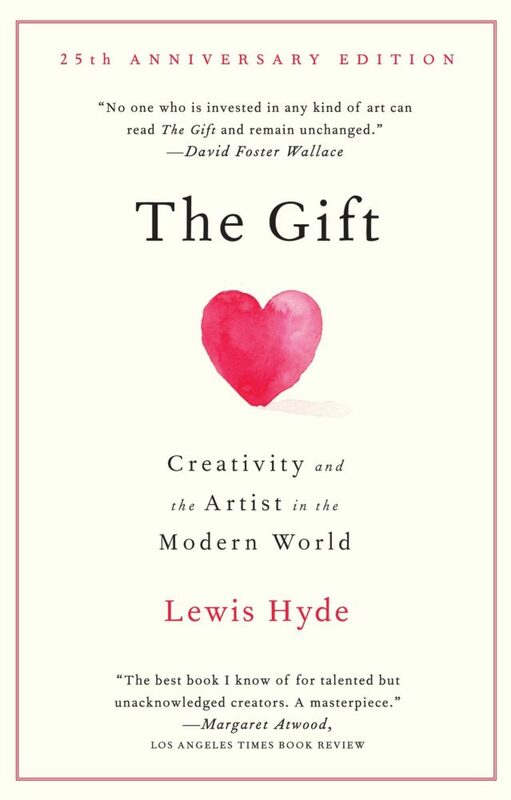 I’m taking a break from the art studio to talk about a book that has been on my mind these past few weeks: Lewis Hyde’s The Gift. It has been referenced in many books on the business of art that I have been reading, but it’s ideas are unique and worth discussion on their own. Frustration and uncertainty are part of every artist’s life and work. It is almost a given that an artist will struggle and spend time seeking support to do creative work. The idea of the starving artist has taken hold in our culture and has become almost a myth that informs the journey from beginner artist to master. There have been artists who had very hard lives to continue to work, but the idea that every artist must starve has been fostered by a culture that is formed by the market economy which treats everything as a commodity to be bought and sold. Fine art and other creative work has traditionally been part of a gift economy that valued the intangible, spiritual values of faith, beauty and truth rather than the monetary exchange value of products. This difference has been examined and explained in a book by Professor Lewis Hyde called “The Gift.” In his book Dr. Hyde shows through historical and anthropological examples how cultures have experienced art as a channel of truth and goodness and beauty offered to people to help them thrive as a culture. He shows how creativity and artmaking has been the servant of faith and community throughout the centuries until the change in patronage and cultural values brought the market economy to become the dominant process of establishing value. The book is divided into 2 parts: “The Theory of Gifts” in which he shows through historical and cultural examples how creativity and artmaking informed the gift economies of earlier cultures who conducted gift exchanges out of gratitude and faith and as a way of maintaining relationships. Part 2 of the book, The Gift is entitled, “Two Experiments in Gift Aesthetics”, in which Professor Hyde examines the life and work of Walt Whitman and Ezra Pound. Both of these poets rejected the commercialization of art and culture and the analysis of their philosophies and work make illuminating but difficult reading. Chapter 8, “The Commerce of the Creative Spirit,” is an excellent explanation and application of the gift theory to the life of the artist. I highly recommend this book for everybody who wants to learn and understand about the arts in the culture in which we live and work.